You only have one chance to hear those very special words, “Yes, I do”. At that once in a lifetime moment, you want the confidence and assurance of the perfect and most special engagement ring! Jewelry Design Gallery will guarantee you the finest quality and craftsmanship any jewelry can offer. Since 1984, we’ve been educating our over 30,000 customer base on everything there is to know about diamond engagement rings, from cut to clarity! 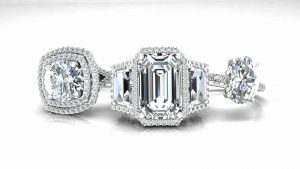 Whether your bride to be is in awe over cushion cut engagement rings or looking to be the ultimate princess gushing over princess cut engagement rings, buying an engagement ring is an investment. We will work to find you the perfect stone to fit in your budget. Our master staff are certified gemologists in all areas. We only sell the finest grade diamonds all accompanied by a certification from the most reputable and respected grading laboratories: The Gemological Institute of America (GIA), the American Gem Society (AGS) and the European Gemological Laboratories. When investing in a diamond for an engagement ring, our gemologist will guide you so you can get the most value for your money. We’ll teach you what you need to know to help you make a wise decision in the most precious diamond for your bride-to be! For every budget and every bride, you will find the best engagement ring that will get you the answer you’re looking for when you come to Jewelry Design Gallery. Diamond education: when shopping for custom engagement rings in classic or unique styles, we give our customers a diamond education—teaching you about every angle of the stone! The engagement ring for your budget: our prices are competitive and can suit every budget! Our mountings and stone settings are done here on the premises. No one can compete with our prices. Design the ring of your dreams. We can make anything! We can custom make any style of ring too: cushion cut, princess cut and more! Using the latest technology and 3-D printing, we work with you every step of the way to build your custom engagement ring. 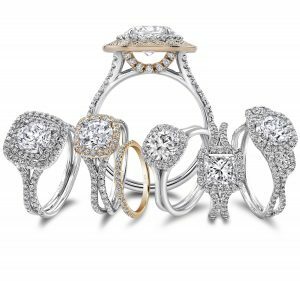 Available for casting in gold or platinum, your dream engagement ring can be set with any type of stone! In a wide range of price, custom designing is our specialty! Are you ready to find the perfect diamond engagement ring of you or your bride-to be’s dreams? Anything you can imagine we can create. Please visit our store located in the Towne Pointe Shopping Center on Rt. 9 S in Manalapan, NJ, or call us today to schedule an appointment 732-536-1184.